The Target Credit Card or Mastercard Credit Card offers great savings and benefits, including 5% OFF on select purchases – which is like an Extra 5% OFF Coupon every day. You also can save on shipping when shopping online. Don’t miss the Target Ad Sale for this week. 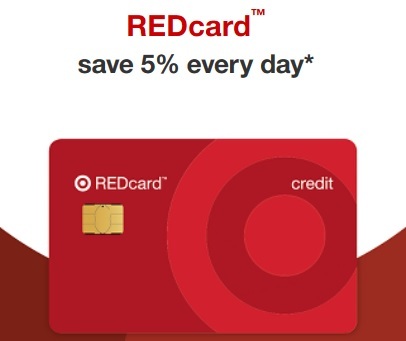 – 5% OFF Discount every day – use your REDcard cards like Target Debit Card, Target Credit Card or Target Mastercard at any Target stores or when you shop online from this retailer. Some exclusions apply. – Early access to special events, products & promotions. – 10% OFF coupon on your REDcard anniversary, exclusive extras, including special items & offers. – Free shipping on most items and Free 2-day shipping on hundreds of thousands of items, when shopping online. – You can stack your 5% REDcard savings with Cartwheel and Target Subscriptions savings. – Save 5% on specialty gift cards for travel, restaurants, movie tickets and more when you use your REDcard. – Early Access to Black Friday Deals, from November 21 beginning at approximately midnight. – Starbucks discount – 5% OFF when you use your REDcard at any in-store Starbucks location. – Cartwheel – Get 5 to 50% OFF on hundreds of items in stores & also save an extra 5% when you pay with your REDcard. – Target Subscriptions – Take 5% OFF on everyday essentials delivered on your schedule when you subscribe, plus 5% OFF when you use your REDcard. The credit cards have no annual fee and the Annual Percentage Rate (APR) for Purchases is 24.90%. Penalty Fees – Late Payment up to $38, and Returned Payment up to $27. The interest for credit cards are high, but if you pay your balance in full you’ll pay no interest.